One month is the Cleveland Marathon and I am signed up to do the half marathon race of 13.1 miles on May 20. I signed up for this spring race quite a while ago, after I completed the Akron half. I liked the idea of having this goal and it seemed like a good idea. It would “force me” to stay in good running shape through the fall, winter and early spring months. If I sign up early, I would save money – the price goes up significantly as the race gets closer! Worst case, I could simply walk instead of run. Or I could always switch to the 10K (6.2 miles) if things didn’t go well with my training. When you look at the Cleveland Marathon race, there are actually 7 races that weekend: the full, the half, 10K, 8K, 5K, 1 mile, kid’s fun run as well as walking divisions in both for most of the races. The full marathon even has a wheelchair group that is incredibly fast and extremely inspirational! I’ve familiar with the Cleveland Marathon because I’ve volunteered at one of the water stops every year since 2010. Seeing all those runners really inspires me. I want to be one of them! Instead of having bike riding season to help to prepare me for the half (like I did with the Akron half marathon last fall), I’ll have the Cleveland half marathon training through the winter to help to prepare me for biking. So, did signing up for the half marathon help me? How did the training go? After I signed up early with Jill, a lot of my water station friends also signed up to run the half (at least 4, that I know of) and we’ve been encouraging each other all winter! A BIG PLUS! The half marathon has certainly was on my mind all during this past winter. I know I ran more than I would have. So that was a good thing. It didn’t “force” me to work out, but certainly motivated me. My running plan of 3 days a week (with the longer run on the weekend) has been hit or miss, with more time on the treadmill than I ever expected and not enough outside in the fresh air. Not so good. On the other hand, my cross training plan has gone better than I anticipated. That’s better than no training, right? And I’ve enjoyed that part – a lot! That is definitely a good thing. Cross training is the exercise that runners should do to avoid injury of overuse. In looking at my actual results compared to my training plan, I think I’ve done more cross training than I have done regular training runs. My cross training for the Cleveland Half Marathon included a lot of core and strength training, topped off with indoor cycling – spinning. All good. I’m trying to guess what the weather will be on race day. 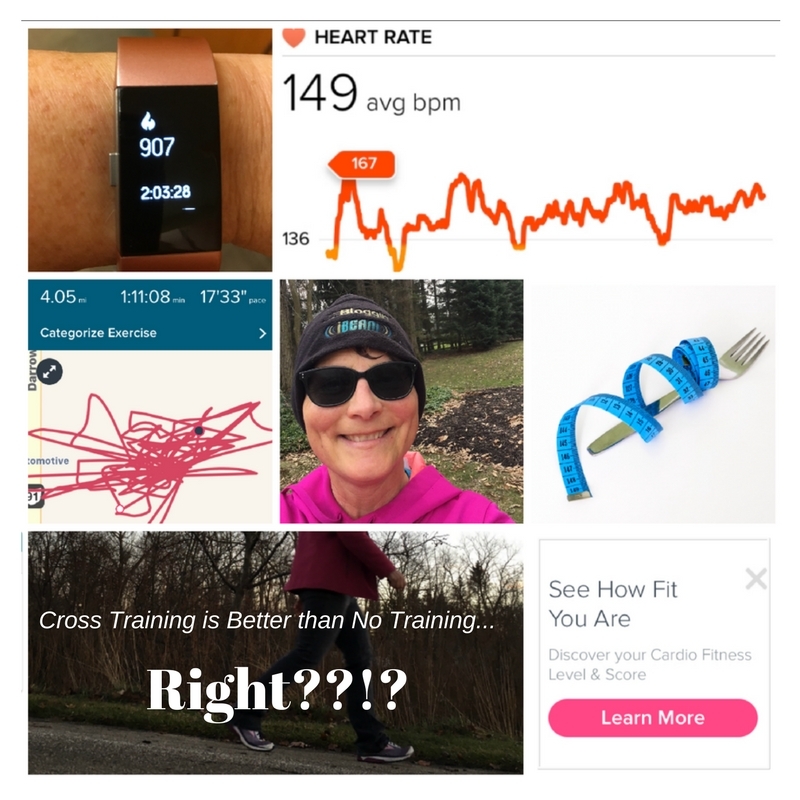 Last September when I ran the Akron Marathon, I found it easier to do the training schedule with the weather – if it rained lightly, I would still run and if it poured, I’d wait for the next day. The actual race day conditions were much hotter than I had anticipated, but I had done a lot of training in the heat of summer, so it wasn’t an unknown. May in Cleveland can be cold, wet, snowy or super hot. It has been known to snow and hypothermia is a concern. And it’s been in the 80’s and heat exhaustion is a concern. But I can’t control the weather. I can control what I do to get ready. So why do I obsess over the weather so much?!? I’m looking forward to getting a long run in today and with the better weather in the forecast, enjoying the outdoor weather for more intervals, tempo runs and long runs during the next few weeks. When I think about the race, I’m also looking forward to seeing my skiing friends at water station #4 at mile 7.3!! It will be a big mental boost at a point in the race when I will need it. It will be very different this year experiencing the race as one of the runners! Perhaps most of all, I’m looking forward to getting a photo (or more) with the women from Becoming Elli before the race. I had a daydream while I was running the other day about some of the Becoming Elli women coming out to watch, make a sign and cheer us on. Is that silly of me? I used cross training to get ready for the Big Sur Marathon. I had terrible plantar fasciitis and could barely walk. Running was not an option. I did a ton of pool running (deep water running using a floatation belt) and cycling with my bike in the trainer. I also continued with my strength training. Obviously, It wasn’t optimal marathon training. I wouldn’t recommend it but I was able to run the month before the race and I finished it. There was no way I was missing that one! I actually felt great the next day and did a lot of hiking that week in Yosemite. Big Sur Marathon is a once in a lifetime race! I can totally understand why you didn’t miss it and I’m so glad that you were fine the day after and able to hike all over Yosemite! That is very encouraging! I’m a huge advocate for strength/cross training! I think that it makes you a stronger runner overall. Even if you’re training hasn’t been as great as you would like, the cross training will definitely help. As far as the race goes, as long as you run the miles at a comfortable pace with a smile, I think you’ll have a great experience! Thanks Kim! I’ve hears that smiling during the run actually helps and believe me, I need all the help this time! These comments make me feel better about trying to do my half marathon later this month. I’ve done lots of cross training but am really behind on the running. I may end up walking much of it, which was not my original plan, but it’s better than not doing it at all. I’ll try to remember to smile too! Yep, a smile looks better in the picture and helps your body remember that this is FUN!